Located a couple miles south of downtown, Albuquerque International is a beautiful place to greet one of the sunniest cities on earth, not only for its friendly staff but brightly-patterned terminals. Make the most out of your stay by having the right ride ready, whether it’s a simple shuttle to get to work or deluxe limousine for making an arrival. Drive north on Yale Boulevard for easy access to a slue of hotel stays offering free shuttles, whether it’s the upscale Sheraton Albuquerque Airport Hotel, which offers 24-hour lifts, or the more laid-back Best Western Inn & Suites a couple blocks north. Keep other choices in mind before making a big commitment, whether you’re heading to the city for business or planning a vacation with the family. Book a taxi for quick drop-offs to Albuquerque Convention Center, or take advantage of the city’s unique nightlife with a regular limousine perfect for cruising down Central Avenue. If you’re a nature-lover, look forward to the countless attractions surrounding the lush Rio Grande River, whether it’s the ABQ BioPark perfect for getting the family ready for a trip in a roomy bus or van, or take a private a tour of Old Towne’s historic museums via your own private sedan. With non-stop rides at ABQ airport, SuperShuttle can get you there with their quality sedans and SUV vehicles from ExecuCar. Find other destinations that offer GO Airport Shuttle or search for other transportation providers at Love Field airport. Albuquerque airport rides are located at the south side of the baggage claim terminal. Travel the Duke City in our shared ride vans for hire; we are ready at all times to service your every need; book before arrival for airport transfers and ground transportation. When you arrive at ABQ airport you can make reservations for private for private vans open all day long for travelers seeking to cover any and all that Albuquerque has to offer – from the Indian Pueblo Cultural Center to the Rio Grande Zoo. Want to travel in Albuquerque without the heat? Need a luxurious, comfortable ride from the airport? Book a luxury sedan to transfer you and even transport you to places like Explora and the Sandia Peak Tramway. Visit Albuquerque Biological Park and the Museum of Art and History with our personal drivers for hire stationed at every important location in Albuquerque, ready to pick up whenever you want. Admire the Petroglyph National Monument in New Mexico with our charter SUVs with professional chauffeurs and see more of what Albuquerque is all about. We will pick you up, drop you and wait for you while you visit some of the best tourist places in Albuquerque; our dependable taxi service will take care of all your traveling needs. Classy airport transfers by hiring our high-class limousine along with our high-class chauffeurs, with the option to continue your trip with combo bookings with many discounts. Buses for hire anywhere in Albuquerque; spots like Albuquerque Aquarium or the Cliff’s Amusement Park for family fun and frolic covered. Going to Albuquerque? We’ve got you covered. 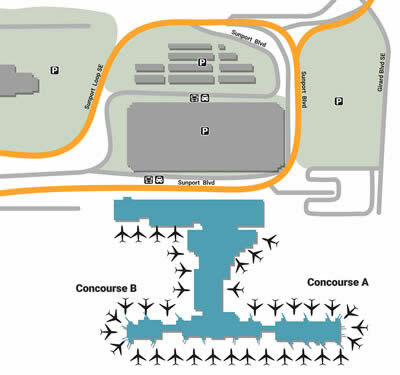 Check out our terminal map to find out where you need to go, whether you are looking for your terminal or how to get to your curbside pick up. ABQ airport transfers passengers in limo buses and sedans while daily bus and shuttle services are provided by a variety of carriers taking you to locations via Routes 50, 222, and 250 to the city of Albuquerque as well as Santa Fe, New Mexico. Commuter train services are offered by Amtrak and Albuquerque ride and provide connecting service to the New Mexico Rail Runner Express/Sunport International Station. Non-stop services are available to the Alvarado Transportation Center in the downtown of Albuquerque and Santa Fe as well to locations north and south of the airport. Rental car services available at Sunport include Alamo, Budget and Enterprise are located a half mile west of the terminal building in the consolidated rental car center which is easily accessed by a shuttle bus. A variety of taxi companies and limousine services offer ground transportation and courtesy vehicles are available through Albuquerque hotels and motels. There are several lodging options located within less than a mile from the Albuquerque International Sunport. The Comfort Inn, Holiday Inn Express Hotel & Suites, and Staybridge Suites Albuquerque-offers shuttle service to and from the airport and are quick overnight well-located stops. All are conveniently located within a three-mile radius to all the major attractions the city has to offer. Whether on business or vacation these lodgings will make your trip effortless from beginning to end. You will be able to locate four stars to two star accommodations from the Hotel Parq Central to the Quality Inn and Suites for your stay. Albuquerque has spent the last forty years hosting the Albuquerque International Balloon Fiesta, which has over a hundred thousand viewers of this world-renowned attraction. In addition while you are visiting you can visit the Albuquerque Museum of Art and History, which shows the city’s origins, which was a Spanish colonial village. The Indian Pueblo Cultural Center offers visitors information on Native American culture and history. There are many things to do in Albuquerque such as walking the many trails throughout the desert area such as the popular Old Town, which has historic buildings for you to visit.